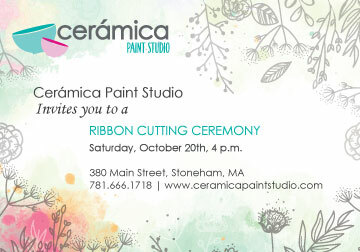 Join us for a Ribbon Cutting Ceremony and Reception at Ceremica Paint Studio on Saturday, Oct. 20 from 4:00-7:00PM at 380 Main Street. Ceremica, a paint your own pottery studio, welcomes all ages and skill levels to relax and enjoy the creative process of painting ceramics. The studio offers as much or as little assistance as you need to complete your projects. Drop in and work on your own or bring a group or a party. All are welcome. Light food and refreshments will be served. Saturday, Oct. 20 from 4:00-7:00PM.